We were heartened to see such an outpouring of support for the immigrant community when the program cuts were announced. From religious leaders and elected officials to supporters throughout the community, people spoke up and stood up for immigrants’ rights to due process. We especially thank Representatives Doggett and Castro, as well as State Representative Gina Hinojosa for their outspoken support. Nevertheless, the temporary cessation of LOP funding underscores the vulnerability of low-income immigrants throughout the region and the country, particularly those in detention and facing deportation. “Access to basic legal information, if not full-on representation, while going through a court process with such high stakes should be guaranteed,” said Lightsey. 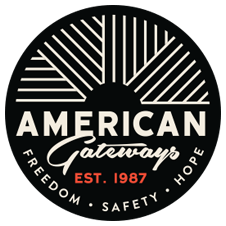 “The basic human rights of tens of thousands shouldn’t hinge on a single funding stream.” As we continue to serve our LOP sites, American Gateways will continue to strengthen and expand our existing programs to ensure that they are sustainable over the long term. We also call on the Trump Administration and our elected officials to do more to protect the rights of immigrants guaranteed by the U.S. Constitution and international human rights norms.